Twin brothers, Marc and Tony Stevenson were inspired by their Uncle who had served his apprenticeship in the Chatham Naval Dockyard in the 1940s. Whilst there, he started making toys from off-cuts and soon built up a reputation for making rocking horses. In 1982, the two brothers established their own business in an old shed on the family farm. Today Stevenson Brothers are still based in Kent and over the past 25 years have produced circa 6,500 rocking horses, which are universally recognised as works of art. They have reintroduced the traditional rocking horse as a ‘today’ item and their large showroom is full of interesting new and antique horses. There is even a ‘Hospital’ for those treasured steeds, which are in need of skilful and loving attention. New horses are hand-made using only the best materials and traditional craftsmanship. Each horse is numbered and dated on a brass plate and can even be fitted with a secret compartment! Tulip wood and Oak are used for their painted horses, but they also use Maple, Cherry and Yew. 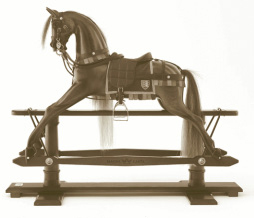 More recently, Stevenson brothers have developed a special relationship with Walnut in a ‘Limited Edition’ rocking horse.